One of our greatest travel adventures came from the most unlikely of places: Mexico. We recently took a brief roadtrip from San Diego to Ensenada south of the border. Our goal was to visit the Valle de Guadalupe wineries in Baja, Mexico. What started as a drive on the Ruta del Vino Valle de Guadalupe (the Guadalupe Valley Wine Road) to experience Mexican wine turned into something much more substantive: an important life lesson in preconceptions. Many years ago, I heard from a friend in the wine business about Mexican wine and the Baja wineries. It was spoken with a great deal of skepticism and a condescending edge. It was as if he was saying, “You’ll never guess what those Mexicans are trying to do now.” His words stuck with me. “Mexican wine” isn’t new. To me and most people, “Mexican wine” was a six-pack of crappy beer. I’m not alone in that opinion. The music group Fountains of Wayne has a song called “Mexican Wine” about a person hitting rock bottom, not caring about anything in life, and drinking. Of course, many of those impressions are from the pre-NAFTA era. Times change. I also remember my first trip to Tijuana, Mexico. The retching poverty at the border crossing, children my own age begging for money, and miles of buildings in shambles left an impression on my young mind. At least, that was the way my mind remembered it from the early 1980s. So, on a sunny cool day, we packed up the car and drove from San Diego to Mexico in search of the Guadalupe Valley wineries. Getting to the Mexico wine country was easy. Crossing from San Diego into Mexico involved no border control checks whatsoever. And seconds later, we were cruising down the road in Mexico. Driving through Tijuana, we passed office buildings and high-rise apartments. The coastal road (Mexico Route 1/1D) was broad and fast, even stopping occasionally to pay tolls. Any preconceived notion of Mexico as an undeveloped country were quickly put aside as we drove down the Pacific coastal highway past scores of new oceanfront condominium towers. This was not the Mexico I remembered. Nearing Ensenada, the Ruta del Vino Valle de Guadalupe turns inland and quickly climbs elevation (following Mexico Highway 3). Everywhere the eye can see are the rolling hills of the Mexican wine country planted with vines. We’ve visited a lot of wine regions around the world: from the Moselle in Luxembourg to Stellenbosch in South Africa. The Baja wine country in the Valle de Guadalupe just may be one of the most beautiful in the world. I recently bumped into the same wine industry friend. He was telling me all about the amazing wines from Mexico coming from the Valle de Guadalupe wineries. He didn’t remember his earlier comments, but I did. He told me the region was the new Napa without all the Silicon Valley money and entitlement. I learned some of the best young winemakers in the world were coming here from places like Napa, Spain, Chile, and Argentina. He told me that the Guadalupe Valley had the same climate as Sicily and many of the same soil characteristics of the Cote du Rhone. He said now was the time to drive from San Diego to Ensenada and experience the Guadalupe Valley wine region before it got ruined. We spent two days crisscrossing the valley and darting between the various Baja wineries. Visiting winery after winery, we were able to begin to come to some conclusions. The Valle de Guadalupe weather brings very hot, dry summers (mid-80s) and moderate, humid winters. Morning fogs are common and sea breezes bring a salinity to the soil. In short, this is perfect grape growing weather. You’d expect the vineyards to be like Napa…but they aren’t. Instead of Zinfandel and Pinot Noir, you find Petite Sirah and Malbec. While Napa has focused on mass production and a general consumer palate, the wineries in Guadalupe are focusing on the terroir and a fine wine market. And it was completely unexpected. We really didn’t know what to expect from the Valle de Guadalupe vineyards. We figured the Ruta del Vino might be some kind of tourist marketing ploy. Perhaps there would be some passable wines. We really didn’t think that Baja would have some world-class wineries. And it did. Driving back to San Diego was filled with lots of enthusiasm and excitement. We stopped at the Taqueria el Trailero stand and enjoyed some of the best fried shrimp tacos we’ve ever had. We were high on the Valle de Guadalupe wineries. All that excitement ran headlong into the modern geopolitical realities: The San Ysidro Border Crossing. This is reported to be the busiest international border crossing in the world. We don’t know about that, but it is absolutely the busiest border crossing in North America. We’d been prepared for a long wait to cross the border. The U.S. Government puts out a handy app to indicate the wait time to cross the border called the CBP Border Wait Times app. The app was worthless. We’d been prepared to wait for a couple of hours. We’d heard horror stories of two hour waits to get across the border. We thought we were prepared. We were wrong. 6 hours. Yes, you read that correctly. From the time our car got into line at San Ysidro until we finally crossed the border was nearly 6 hours. For what it’s worth, the entire time we were in line, the worthless app from the U.S. Government indicated a wait time of less than 2 hours and 15 minutes. We believe that good things come to those who wait (and wait we did). Do we regret it? Absolutely not. If we knew what we were in for, we might have done something different (using the Tecate border crossing or different time of day). The more time that passes, the more fondly we look back on the trip and the experience in the Guadalupe Valley. Despite the hassle provided by the U.S. Government, it was worth it. 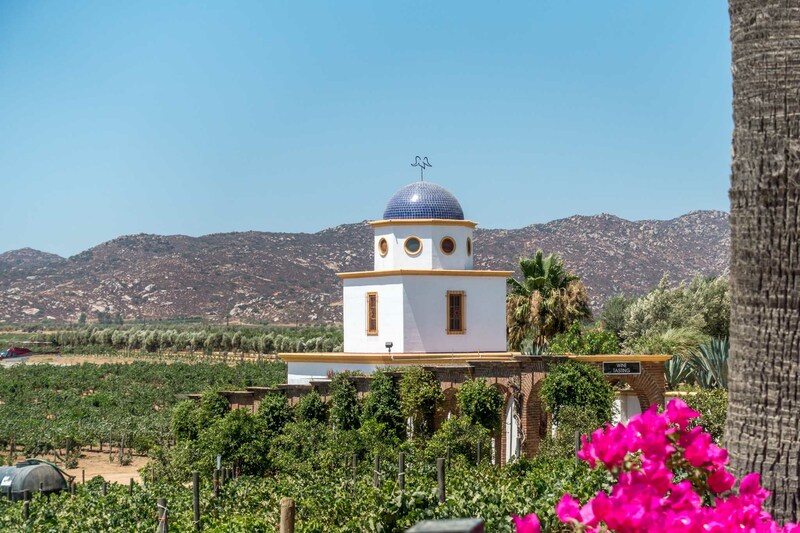 Just like the advice we were given, we’ll say the same thing: visit the Valle de Guadalupe wineries now…before they change. The San Ysidro border crossing from Mexico into the United States is the busiest land border crossing in the world. Millions of people, cars, and trucks make their way north and south of the border here. At some points, the road is over 25 lanes wide. This can result in lots of traffic. The U.S. Government’s app is only moderately useful for indicating relative wait times (is this time busier or slower than other times), but shouldn’t be relied on for accurate information. You may have better luck at other border crossings. Driving in Baja, Mexico is extremely easy. The main roads are all paved and in good shape. However, drivers coming from north of the border in their own cars need to know that car insurance in Mexico is mandatory and your comprehensive auto policy from home is not valid in Mexico. On our journey, we purchased insurance from Mexico Insurance Professionals. 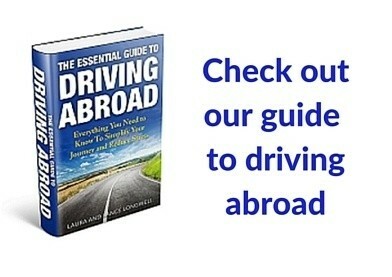 Also, if you are worried about driving in Mexico, our book, The Essential Guide to Driving Abroad, may be helpful. Despite the fact that Guadalupe Valley wine is not from Napa, expect to pay Napa-level prices. Reasonable bottles will start around $25, mid-range bottles around $35, and higher-end bottles north of $50. The quality is excellent, but this is primarily driven by supply: a Guadalupe Valley winery is much smaller and produces smaller quantities, which keeps prices higher. It’s relatively straightforward to visit the wineries. Unlike wineries in other parts of the world (such as France or Italy), you don’t need an appointment. Keep in mind that the wineries here tend to have more limited hours than what you may be accustomed to. Most wineries won’t open before 11:00am (some won’t open until noon or 1:00pm) and most close earlier than you might expect. Some wineries will start closing at 4:00pm, however most wineries will close between 5:00 and 6:00pm. These limited hours mean you’ll want to plan carefully which wineries you want to visit. Wineries all have lots of space, so parking isn’t a problem. Most have English speaking staff. About half charge for tastings. This valley is relatively relaxed, however, it is a popular in-country destination for affluent Mexicans and is a get-off-the-map hippie hideout for many Americans. The yin and yang of money and relaxation means that you can find exactly what you want in the Guadalupe Valley. As we discovered, hotels in Valle de Guadalupe can be expensive. Like really expensive. If you’re heading to the Guadalupe Valley, see our specific recommendations in the section below. From experience, there are very few mid-range hotels in the area. You are limited to either really expensive ultra-luxury or super-budget accommodations. 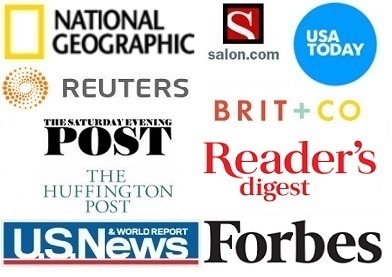 If you’re looking for something more mid-range, consider a vacation rental (see here for a great selection of vacation rental properties). Alternately, you might consider some of the Ensenada resorts (see examples here). While we’re big proponents of independent travel, if you’d rather not be bothered, it’s possible to get a Guadalupe Valley Wine Tour from San Diego as a day trip (such as this one). Or, if you’re staying south of the border there are also Valle de Guadalupe tours from Tijuana or Ensenada (see options here). Ask anyone in Baja and you’ll likely get very different recommendations for the best wineries in Valle de Guadalupe. After spending a long weekend exploring, here are our favorite wineries in the Guadalupe Valley. As mentioned above, Valle de Guadalupe hotel options can be a little limited. We went at the absolute peak season: a three-day weekend in the summer. Getting an affordable room in the Guadalupe Valley proved impossible and we ended up renting a beach-front house near Ensenada. This super modern and ultra-minimalist property is part hotel and part camping (yes, it is glamping). Rooms at the Hotel Encuentro Guadalupe offer stunning views of the Guadalupe Valley and put you right in the heart of the wine region. There’s no finer place to stay. This hotel offers a little something for everyone. At Hotel Boutique Valle de Guadalupe, they have traditional rooms, ultra-modern villas, lofts, suites and even a private chalet. The hotel sits in the valley and has great views of the surrounding hills. Located in the heart of the valley, Hacienda Guadalupe offers traditional accommodations in an upscale environment. The hotel sits in the heart of the vineyards and has beautiful grounds. It’s a very popular wedding destination. If you have difficulty finding accommodations in Valle de Guadalupe, look to Ensenada. Just 30 minutes away at the start of the wine route, there are number of other options in Ensenada. You can find several resorts on the water, as well as some house and apartment rentals. This is the very definition of street food. The Taqueria el Trailero stall located at km 101 on the Ensenada-Tijuana highway (heading in the direction of Carretera) is not actually in the Guadalupe Valley, but you’ll likely pass it coming to and from. It’s absolutely worth a stop. The food is insanely cheap and even more insanely delicious (splurge on the shrimp tacos). One of the more popular restaurants in the valley, Laja offers inventive foods with a view. This is haute cusine, and expect to pay California-level prices. A splurge but worth it. A reasonable lunch spot serving creative tacos and sandwiches. The Adobe Guadalupe food truck menu changes frequently. Pick up a bottle of wine from the neighboring Adobe Guadalupe winery and enjoy your food on the picnic benches. Located in the very visually unappealing port area of Ensenada, Manzanilla offers good food in an upscale environment. The lack of view or ambiance is disappointing. We geek out on all this historical and were surprised to learn there has actually been a long history of wine production in Mexico dating back to the early-16th century. Supposedly, wine production began some time around 1524 when Cortez ordered vines planted to sustain his soldiers occupying the Aztec Empire. The order was given to plant 1,000 grapevines for each 100 native servants (i.e., likely slave). However, the growths were planted in tropical environments and quickly died. Subsequent efforts in other Mexican regions (namely Coahuila, Puebla and Zacatecas) were more successful. In fact, the very first and oldest winery in the new world is in Mexico: Casa Madero. Founded in 1597 in Santa Maria de las Parras, this winery is still going strong. Grapevine cuttings from this region would eventually populate the wineries in Napa, Sonoma, Temecula, Argentina, Chile, as well as re-population efforts back in Europe after blights. On the eve of the 18th century, in 1699, Charles II banned production of wine in the colonies, as a way of propping up failing wine production in Spain. Even then, efforts at economic protectionism were not ultimately successful and the production of wine in Mexico continued. Most of that production continued on the grounds of the Catholic missions. The very first Baja winery was founded in 1701 by a Jesuit priest on the site of the Loreto Mission. Dominican friars followed and began producing wine in 1843 in the Guadalupe Valley. All good things must come to an end and so much wine production. In 1857, the Mexican government seized the land of the Catholic Church and booted them from the country. Most Catholic missions and their vineyards languished. After the 1910 Revolution, Mexicans turned their attention to that other Mexican wine: beer. Wine production didn’t really take off until the 1970s, when the Guadalupe Valley was replanted, a wine school was opened in 1972, and Mexican interest in wine took off. 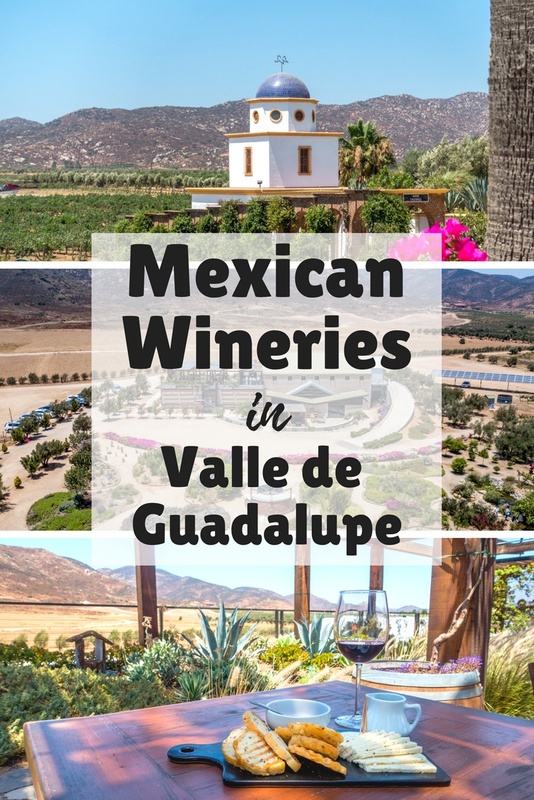 In 1987, the Mexican government opened up the domestic market to foreign wine producers, which had the Valle de Guadalupe wineries hard, however, the region is back and interest in the Guadalupe wine has never been higher. What do you think about Mexico’s Intriguing Wine Country: The Valle de Guadalupe? I keep hearing and reading all about this area! Looks amazing (other than the sucky border crossing! ), definitely need to visit before it gets too busy! Thanks for sharing. If you can cross back at an off-peak time, the trip is great. Luckily, we had such a good time that the annoying part is just a footnote in the story. Informative, well-organized and well-written post. Thank you! Thank you! So glad it was helpful. If you decide to visit the Guadalupe Valley, we hope you’ll let us know how it went!